The PX4i’s smart design features support increased productivity in demanding environments. As a Smart Printer, it can host stand-alone applications, developed through Intermec Fingerprint programming language, which reduce errors and streamline operational processes. Smart Printers can eliminate the PC and control other devices directly (such as scanners, scales, applicators), improving efficiency and decreasing infrastructure costs and complexity. The PX4i’s device management and diagnostic capabilities, provided through Intermec SmartSystems™ and Wavelink Avalanche™, reduce downtime and simplify deployment. With user-selectable, all-in-one programming languages (Fingerprint, IPL, ZSim, DSim), the PX4i fits with drop-in simplicity into Intermec or mixed printer environments. 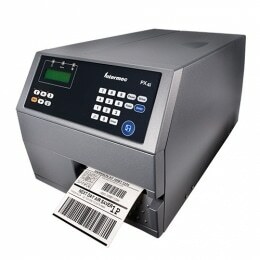 Its modular design facilitates integration into automated labeling applications and industry- standard connectivity options support fast deployment.